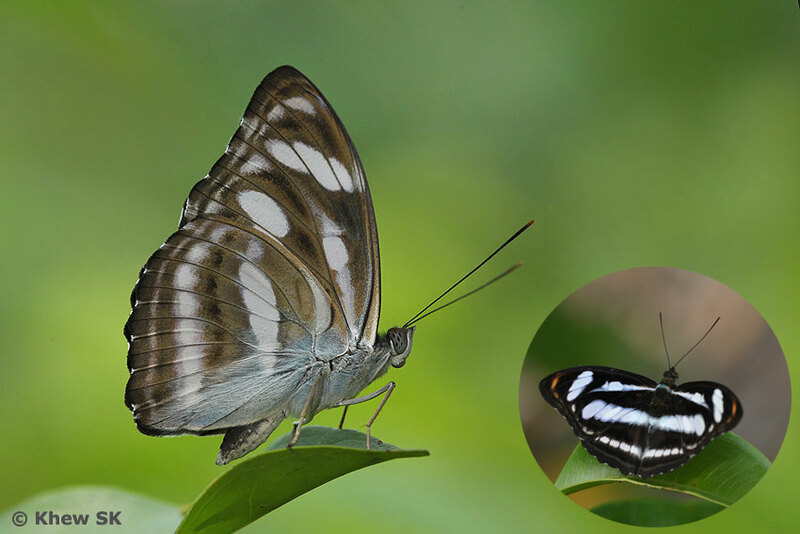 The genus Athyma is represented by five species in Singapore. The Colour Sergeant is the most common of the five. It is widely distributed, and can be found in the nature reserves as well as urban parks and gardens. The caterpillar host plants, at least 3 Glochidion spp., can be found cultivated in parks or growing wild in the nature reserves. The female occurs in two forms - f-neftina and f-subrata. The male, shown here, is territorial and returns to its favourite perch to observe its surroundings and chase intruders away. It features the typical black-and-white striped patterns like all the members of the genus. The upperside of the male is black with bluish-tinged white markings. This individual, shot in the nature reserves, has a rather prominent orange apical spot on the forewings above (Inset). 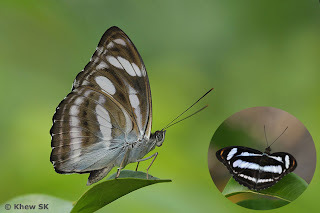 The typical male Colour Sergeant has white apical spots instead of orange, although the orange-spotted "form" occurs with regularity in Singapore.